A confusing folly committed by the new government in January 2015 happened to be the listing of the Central Bank and other financial institutions away from the Ministry of Finance. This was going against the tradition and also against the legal order. Thus, the Central Bank and related institutions were listed under the new Ministry of Policy Planning and Economic Affairs which functioned under the Prime Minister. Similarly, the state banks whose ownership is legally vested with the Secretary to the Treasury were listed under the Ministry of Public Enterprise Reforms. This was an awkward arrangement that defied all logical thinking. As owners of the state banks, it was the Minister of Finance who was responsible for state banks. Yet, the new arrangement had effectively clipped his powers, making him accountable by law for things done or not done by his leader in government, namely, the Prime Minister. After this illogical allocation of institutions under different ministries was announced, this writer immediately drew the attention of the Government to its folly. In an article published in January 2015 under this series, this writer pointed out that the listing of the Central Bank under the Prime Minister was both legally and operationally unworkable (available at: http://www.ft.lk/columns/listing-central-bank-under-pm-unworkable-legally-and-operationally-but-a-step-toward-banks-independe/4-384736). This was because though it has been listed under the Prime Minister, the Central Bank has to do all its dealings by law with the Minister of Finance. Though macroeconomic management had been assigned to the Prime Minister under the new arrangement, he could not do it effectively since the two arms involving such management, namely, the fiscal policy and the monetary policy, had been under the Ministry of Finance and an independent Monetary Board, respectively. Hence, the Prime Minister as the Minister in charge of the CB was a usurper. The objective macroeconomic policy is to maintain the total demand in the economy, also known as aggregate demand, at a level equal to total supply known as aggregate supply. But if the Ministry of Finance follows an expansionary fiscal policy then the aggregate demand will increase, defeating the objective of the tight monetary policy pursued by the Central Bank. With increased aggregate demand over aggregate supply, the economy will get overheated, making price stability a difficult goal and causing a consequential fall in the exchange rate. 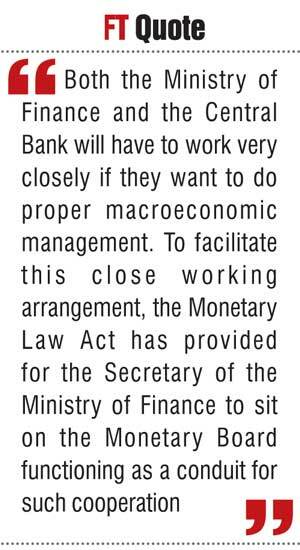 Hence, both the Ministry of Finance and the Central Bank will have to work very closely if they want to do proper macroeconomic management. To facilitate this close working arrangement, the Monetary Law Act has provided for the Secretary of the Ministry of Finance to sit on the Monetary Board functioning as a conduit for such cooperation. Hence, the umbilical cord connecting the Central Bank with the Ministry of Finance cannot be severed by a mere delisting of the bank from the Ministry. Increasing the aggregate supply is not a function of the CB, but of the PM. Hence, when the PM took over the CB, he took over control of both aggregate demand and aggregate supply which cannot be done by the same institution. That is why in all the countries an autonomous central bank has been created to control aggregate demand in line with the changes in the aggregate supply. This was the macroeconomic anomaly created by the new government by listing CB under PM. Apart from this, there are legal and operational issues created by the new arrangement. It was also pointed out that from a legal point, the Minister of Finance in no way can divorce himself from the functions of the Central Bank. Thus, the Central Bank’s relationship with the government is through the Minister of Finance though it has not been explicitly spelt out in the Monetary Law Act. But, in many recent central banking legislations such as those found in Bhutan or Nepal, it has been explicitly provided for that the government should communicate with the central bank only through the Minister of Finance. In the inverse, the central bank too cannot directly communicate with the government and it has to do so through the Minister of Finance. Hence, the Minister of Finance is the protective barrier between the government and a central bank that assures its independence and thereby helps it to attain its goals. The Monetary Law Act which is the legislation governing the Central Bank has stipulated the role of the Minister of Finance in relation to the Bank. Section 12 stipulates that the Governor is appointed by the President on the recommendation of the Minister of Finance. The three private members are appointed to the Monetary Board by the President again on the recommendation of the Minister of Finance in terms of Section 8(2)(c). The salary of the Governor is also fixed by the President on the Finance Minister’s recommendation as per Sections 12(3). Under Section 14(2), the allowances payable to the other Board members are directly fixed by the Minister in consultation with the President. The concurrence of the Minister is needed for the Monetary Board to appoint Deputy Governors to the bank, as per Section 22. The Minister’s concurrence is also needed for the Monetary Board to release a Deputy Governor to serve in the government or as a director of a bank according to Section 23(3). The Minister also has powers to recommend the removal of the Governor or private Monetary Board members (Section 16) to the President under circumstances stipulated in the section under reference. Similarly, the concurrence of the Minister is needed for the Monetary Board to remove a Deputy Governor under Section 23(2). There are a number of reports which the Central Bank has to submit to the Minister of Finance in terms of the Monetary Law Act: Annual Report of the Bank (Section 35(1)); a special confidential report whenever there are abnormal changes in the money supply or price level or economic disturbances threatening the monetary stability (Section 64(1)); continuation of the submission of those reports until the country is free from such threats (Section 64(3)); a special confidential report whenever there is a serious decline in international reserves (Section 68(1); a special confidential report before 15 September of every year to enable the Minister to prepare the annual budget (Section 116). The currency issue is a joint exercise done by both the Minister of Finance and the Central Bank under the Monetary Law Act. Every currency note issued by the Central Bank shall have the signature of the Minister of Finance in facsimile (Section 53(2)). The Minister’s approval is needed for the Central Bank to prescribe the denominations, dimensions, designs, inscriptions and other characteristics of currency notes (Section 53(1)). A similar approval of the Minister is needed for the coins to be issued by the Central Bank in respect of metals, fineness, weight, size, designs, denominations and other characteristics (Section 53(3)). A new Section 52A has been introduced to the Monetary Law Act in 1998 requiring the Minister to approve of the issue of commemorative notes and coins. Section 39(c) stipulates that if the Monetary Board decides to transfer a part of its profits to the Government, the manner in which it should be done should be decided in consultation with the Minister. The Minister of Finance cannot issue directives to the Central Bank as in the case of other public sector institutions. Yet, in terms of Section 116(2), if there is a difference of opinion between the Minister and the Monetary Board about the appropriate policy to be taken, the Minister can direct the Board to adopt the policy he prescribes by taking responsibility for the consequences of such direction. Act. However, they are all inalienable and therefore, the Minister is responsible to Parliament and to the nation for them. It may be an awkward position for the Minister of Finance to be responsible for work for which he has no role to play. Hence, though the objective of listing the Central Bank under PM is laudable, it is not workable under the prevailing legal structure. It will get into serious trouble in the event of a recalcitrant person occupying the portfolio of finance. However, despite these representations, the Government continued to list both the Central Bank and the state banks in ministries other than the Ministry of Finance even after the general elections in August 2015. It compelled the Monetary Board and the top central bank officers to serve two masters which was an impossible task given their legal obligations. When the new Finance Minister was appointed in mid-2017, the issue was raised again by this writer in another article in this series. In an article published in June 2017, it was pointed out that asking a wing-clipped Finance Minister to fly without the Central Bank and state banks under him was an impossible thing to do (available at: http://www.ft.lk/columns/asking-a-wings-clipped-finance-minister-to-fly-is-a-classic-repeat-of-dunna-dunugamuwe/4-621319 /. The article further argued as follows: “It was a mistake made by the Government to take the Central Bank and state banks away from the Ministry of Finance. It has led to conflicts, practical difficulties and legal issues. Without the Central Bank and state banks within the Ministry of Finance, the new Finance Minister Mangala Samaraweera is like a bird whose wings have been clipped. Obviously, such a bird cannot fly, though the President had wanted that bird to make a quick upward flight lifting the economy also along with him. As predicted, the ship of the economy continued to drift in the high seas. Economic growth continued to fall, while the exchange rate came under severe pressure for depreciation. None of the planned economic reforms could be implemented by the Government. The casualty was the economy which fell to an annual growth rate of 3.1% in 2017, the lowest such growth since the negative economic growth in 2001. In these circumstances, the decision taken by the President to retransfer the Central Bank and the Securities and Exchange Commission to Ministry of Finance was a welcome development. Along with this, there are two other matters that have to be corrected. One is the listing of the state banks back in the Ministry of Finance. There is no logical reason why they should be continued under the Ministry of Public Enterprise Reforms since they are not under any reform program. By law, the boards of these banks are to be appointed by the Secretary to the Treasury. Hence, these boards are accountable to the appointing authority and not to the Minister of Public Enterprise Reforms. The other is the divestiture of the shares owned by the Employees Provident Fund in private banks. The previous government craftily used the funds of EPF and other state owned funds to acquire the majority shareholding of private banks which amounted to nationalisation of such banks. Today, board members and Chairmen of leading private banks are appointed by the Government, making them indirect state banks. Instead of correcting this error, the present good governance government too is continuing to enjoy the enormous economic power which it had got over these private banks. The President should therefore complete his economic reform program by rectifying these errors as well. (W.A. Wijewardena, a former Deputy Governor of the Central Bank of Sri Lanka, can be reached at waw1949@gmail.com).